The Walking Dead is an American horror drama television series developed by Frank Darabont, based on the comic book series of the same name by Robert Kirkman, Tony Moore, and Charlie Adlard. Andrew Lincoln plays the show's lead character, sheriff's deputy Rick Grimes, who awakens from a coma discovering a world overrun by zombies, commonly referred to as "walkers". Grimes reunites with his family and becomes the leader of a group he forms with other survivors. Together they struggle to survive and adapt in a post-apocalyptic world filled with walkers and opposing groups of survivors, who are often more dangerous than the walkers themselves. Much of the series takes place within the Atlanta, Georgia metro area and surrounding countryside. Later, the setting transitions to other parts of the country, including Alexandria, Virginia. The Walking Dead premiered in the United States on October 31, 2010, exclusively shown on cable television channel AMC and internationally on Fox International Channels. As a result of very favorable Nielsen ratings that rank the show unprecedentedly high for a cable series, AMC has renewed the series each year. 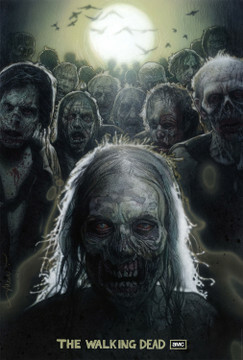 Beginning with its third season, The Walking Dead attracts the most 18- to 49-year-old viewers of any cable or broadcast television series. It is presently airing its seventh season, which began on October 23, 2016, and has been renewed for an eighth season to air in late 2017. The series has been well received by critics and nominated for several awards, including the Writers Guild of America Award for New Series and the Golden Globe Award for Best Television Series – Drama. An AMC companion series, Fear the Walking Dead, debuted on August 23, 2015.